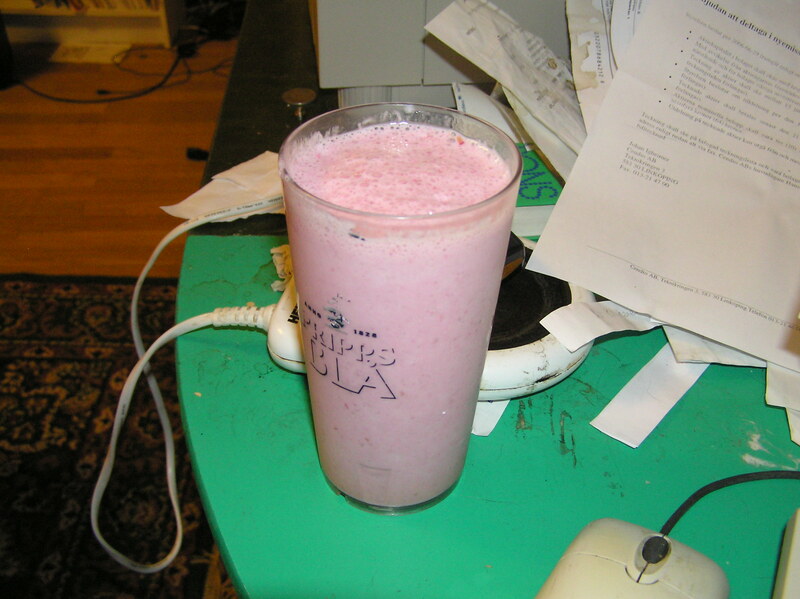 A home made Raspberry milkshake. Put frozen raspberries, a little ice cream and milk in a blander. 2007-01-18 [Amaranthine]: Already having fun with your new blender I see. 2007-01-19 [Hedda]: Yepp! I should blend more stuff! 2007-02-02 [shinobi14]: Ever tryed blending chocolate milkshake and Crunchy? Ace drink, but not for anyone that likes their image. lol. And id be interested on how that herring drink went... Send me the recipie? 2007-02-03 [Hedda]: Herring doesn't blend... So it's milk with pieces of fish in it. 2007-02-13 [Hedda]: No, it was canned herring (with union and stuff, you know?) and Lilo doesn't drink milk (which is way better than Kali who loves milk and then pukes like a cat every time afterwards).